The Bay Area’s strong economy directly benefits its housing markets. It’s no accident that home prices in the Bay Area have been rising steadily while the region’s economic recovery outpaces that of California and the nation. Here at Pacific Union we’ve regularly pointed out that strong job growth has benefited homebuyers and sellers in our real estate markets. And as conditions keep improving, others are taking notice. Both newspapers were reporting on the latest Case-Shiller home price index. San Francisco prices were up 19 percent in February from a year earlier, second only to Phoenix (23 percent) and just ahead of Las Vegas (18 percent). USA Today noted that San Francisco’s February job growth, at 3.6 percent, was more than double the national average of 1.5 percent. More-recent statistics confirm that Bay Area housing markets continue to grow as the economic recovery shows no sign of slowing. 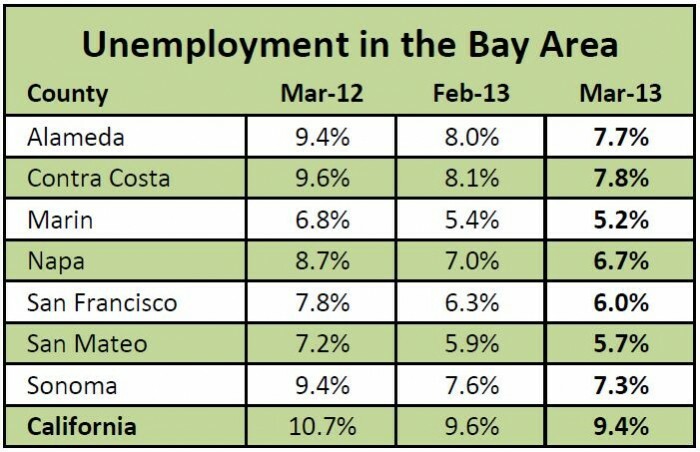 Three Bay Area counties had the lowest unemployment rates in the state in March, according to the California Employment Development Department: Marin County at 5.2 percent, San Mateo County at 5.7 percent, and San Francisco at 6 percent. Statewide, the unemployment rate fell to 9.4 percent in March, from 9.6 percent in February. The national jobless rate stood at 7.6 percent. The Bay Area median home price, meanwhile, was up 33 percent in March from a year ago, and the velocity in our markets during the first quarter of 2013 has been amazing. As we outlined in our recent Quarterly Report, home sales have accelerated, multiple offers are common, and all-cash transactions comprise nearly of sales in some regions.